The idea was once put to me that the human being is capable of seemingly impossible feats such as walking on water and flying without wings; alas others around us, too filled with fear and self-doubt would rather themselves, use their energy preventing others from doing these things. Relationships have begun; simply put, between people who like to create and share images of mood in motion; and people who like to frame them. As in most relationships we learn about ourselves more than anything else, one thing I have learned about myself is that I can be quite technocratic, and sometimes focus too much on strictures for presentational reasons. I do this to make an essentially organic, relational creative process more digestible for those among us who have difficulty sometimes resisting the tendency to cling to the illusion of control. I learned about my own ability to dance with creative tension; that which exists between seemingly opposing extremes; dynamic stability whose discord creates better results. So to cut a long story short, in retrospect, I’m glad that there were oppositions to the rigid time-plan and art-theory selection that I originally presented. And glad that I gave myself permission to just let go and let be. The conversation with art-theory still emerges naturally now. It would not be forced. Technical-theory contributes more strongly to the discourse, and as far as time-plans and love for both art form are concerned, the only question that still persists is [now] that we’ve found love what are we gonna do with it. 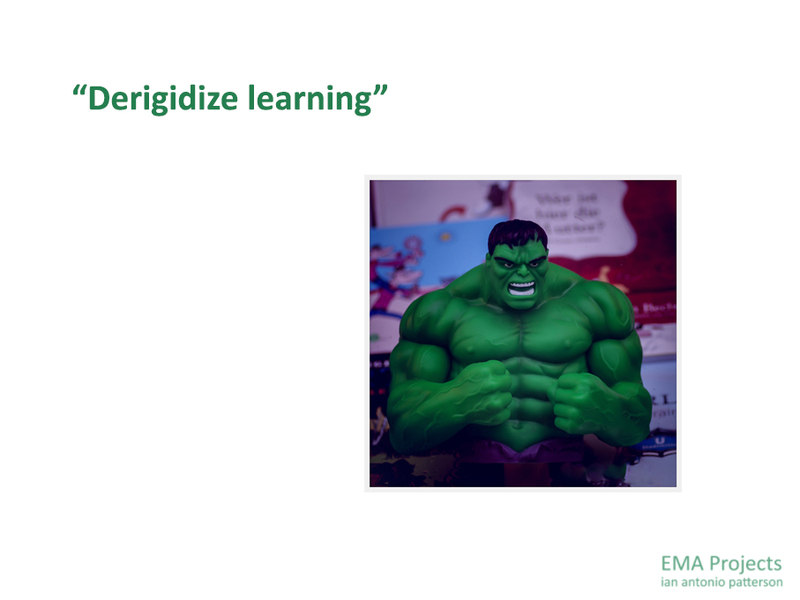 Thus my answer today – “Derigidize learning”: give yourself permission to just let it go and let it be, as arts and passions and interests will speak for themselves and language learning will happen. “Nothing less than perfect” – Art Historian, Script Writer, Computer Scientist. “A fulfilling and effective way to improve task-based language use with ease and interest” – Software Engineer. “Way more aesthetically pleasing to me than heavy gaming” – Yours truly. “Learning happens when passions are involved” – Theologian, Author, Business coach. “Cool !” – Industry Logistics specialist.